Leader of the congregation at Erfurt in the twelfth and thirteenth centuries. He is sometimes, but erroneously, referred to as Samuel de Aphota Dicti Dovlin. He wrote a number of piyyuṭim, including five for Sabbath weddings, one for the Friday evening service, one for the Sabbath of Ḥuḳḳat, one for the Sabbath after Sukkot, and, perhaps, a "Me'orah" for Purim. 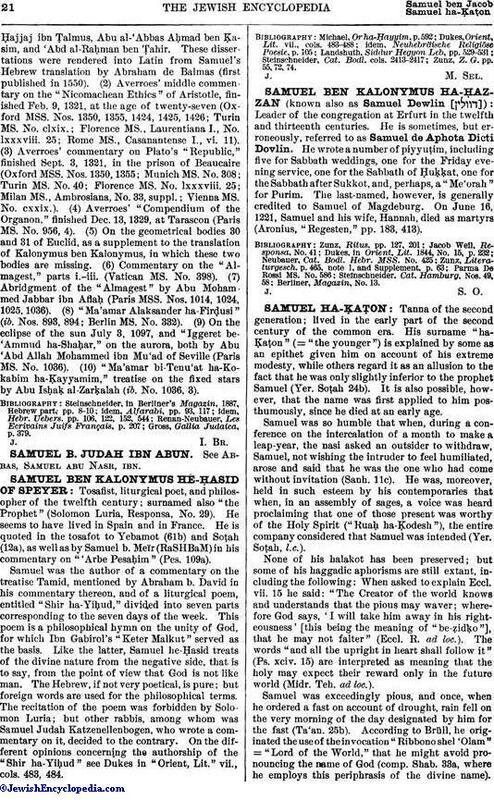 The last-named, however, is generally credited to Samuel of Magdeburg. On June 16, 1221, Samuel and his wife, Hannah, died as martyrs (Aronius, "Regesten," pp. 183, 413).